It’s a sad day in America. The US Navy launched the first carrier-based drone off its deck the other day, off the coast of Virginia. It’s an even sadder day for us in San Diego, as the drone was manufactured – in part, at least – by plants and engineers right here in our own city. The launching of the drone off that deck demonstrates clearly that as drones become more and more integrated into becoming the armament of the nation’s military, they are becoming more and more accepted – here domestically, back in the good ol’ US of A. 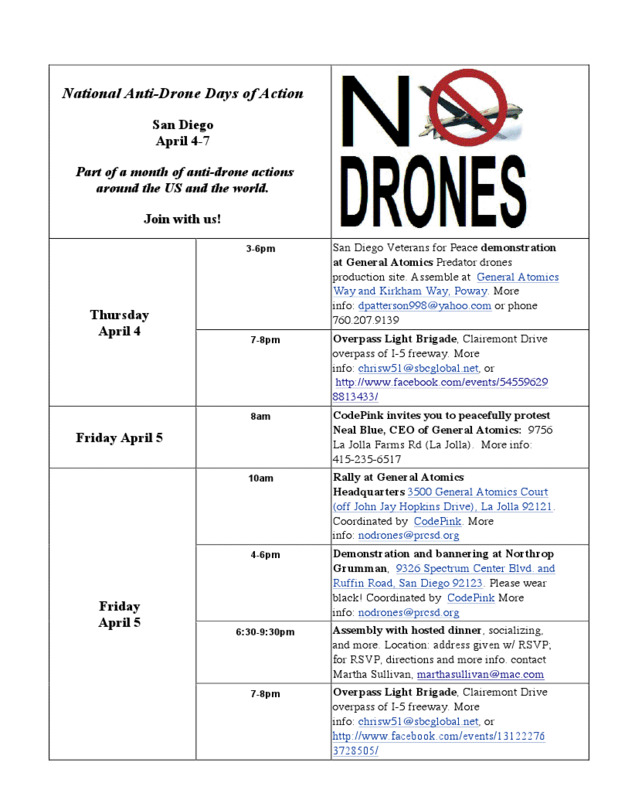 And as drones become more and more prevalently utilized, not just by our armed forces overseas, but by law enforcement, border patrol, and local police departments here within our very own borders, American citizens are more and more subjected to a high-tech surveillance that is quite unlike anything we’ve known in the past – a surveillance that is becoming so pervasive, that it challenges our basic civil rights, freedoms and privacies. The launch off the carrier the other day was just one step. But it is another one in the dangerous fast-paced race to perhaps make this society more watched and surveilled than any other in human history. The drones represent another notch in this technologically-based arching towards the authoritarian state, a trend that has been going on for decades, and continues whether there’s a Republican or Democratic administration. Civil libertarians have long bemoaned the fate of this modern and mounting technologically-run and managed society, where ordinary citizens become less and less involved in government, and become mere objects to watch. This surveillance that is fast becoming the norm, is not only in the skies, of course, but is all around us. Just earlier this year, a high-tech surveillance camera with 360 capability was installed on the end of the Ocean Beach Pier for the first time in history. The surveillance cameras these days are everywhere we go, along freeways, streets, corners downtown, office buildings, banks, offices, schools, government buildings, courts, parks, playgrounds, … the list just continues to grow. And as with more and more surveillance cameras everything, the advent of the world of the drones – which this launch helps to signify – is a world where American citizens will quickly watch our privacy and civil rights vanish. So, not only is this recent launch of the drone an event of historic proportions for the military and our defense system, it’s also significant in the fact that our government continues to have these drones manufactured and tested for more and more tasks that can outlast the endurance of human pilots and law enforcement agents. So, it is a sad day in America to watch this drone that our fellow San Diegans helped design and build that was so proudly launched off a carrier. Somebody has to say it, as the mainstream press is all trumpets. The Navy launched a prototype unmanned plane off a U.S. aircraft carrier Tuesday, a significant milestone on the road to drones taking a place at the heart of naval aviation. The Northrop Grumman X-47B batwing craft was launched by catapult from the deck of the carrier George H.W. Bush off the coast of Virginia. In comparison, the Los Angeles Times (which, for some reason placed its article on the front page of its Business section) called the drone launch a “tech milestone” and “aviation history”. Continuing to gush, the U-T excitedly proclaims that “the era of unmanned drones on aircraft carriers is coming this decade.” It quickly notes that the Navy will issue a call for proposals very soon for the next phase of the development of the drones, and of course, we can expect our own defense contractor – Northrop Grumman – will compete and go after the contract. The complex drone launched on Tuesday was titled the X-47B, and some of its complexities were the result of San Diego engineers and workers. San Diego has become one of the nation’s centers for drone building and the jobs they bring. And our City also was the target of last month’s nation-wide protests against drones and their manufacture. Unlike other “combat” armed drones which are remotely controlled by humans on the ground, “the X-47B is designed to carry out a combat mission controlled entirely by a computer.” Sounds very reassuring, yes? This proud baby of Northrop looks like a miniature B-2 stealth bomber, with a 52 foot wing span. It can reach 40,000 feet and has a range of 2400 miles, and able to get to subsonic speeds. It also can hold 4500 pounds of weapons or bombs. Is this our future? Is this the future of our military? Of our domestic police no matter what color of state? But what about all those San Diego jobs? you ask. San Diego has been a center of war plane, rockets and space vehicle manufacturing since World War II, so, allow it to become the national center for drone manufacture, you say. Yet, what if all those working San Diegans at the drone plants were making nuclear bombs. Would you care as much about those jobs? Doesn’t it matter what we produce? Can we really afford to sell San Diego’s soul for drones? 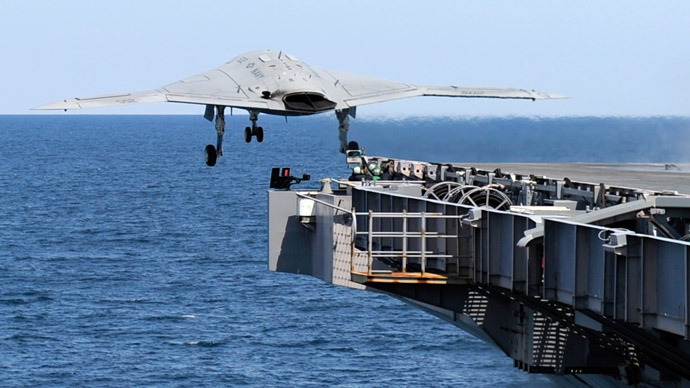 When the drone was launched off that carrier deck the other day, its design was so startling, the LA Times reports, that passing motorists on the local highway were so freaked out, they thought it was a UFO. has there been nothing learned from the terminator movies? doomed we are. It makes me proud. This is an incredible development, and I am happy every day of the week that we are at the forefront of this technology rather than our enemies. I loathe the day when China has this technology and we don’t, because our lives and the lives of over 3 billion of the people on earth are dependent on free and open trade in the Pacific. The US Navy guarantees this this open trade, definitely not China, not Russia. Hey Heck – thanks for cluing me in, did not know that China is our enemy. There’s a heck of a lot of clothes and things in my house that were made by this enemy. WTF? I think Target and Walmart – our largest retailers – are also full of stuff made by Chinese enemy workers. What to do? Oh, yeah, also – doesn’t our enemy China hold big-time bonds on our economy? Geeezz! Man, we’re in a bad situation. Hey, maybe we can sell drones to our enemy and all those Chinese stuff to our enemy Russia! That’s a heck of an idea, don’t you think? Older Article: Discussion on PL Democrats Website: Is the ACLU “Subversive” Because They Oppose Cross at Mt Soledad?